The 2011 Junior Worlds took place alongside the lovely town of Hradec nad Moravici, nearby Opava, Czech Republic. The Sprint race took place in town and consisted of five “weirs” which were river-wide and considerably big in size for a Junior event. The Classic course started at the same place and followed the narrow winding of the Moravice River down the Sprint course, along a 2 meter high slide, and finishing with one more big hole about 3 minutes from the flatwater of the finish line. A steady, drizzling rain interrupted some training and races but the overcast weather did not dampen the spirit and excitement of all the competitors. The 2011 Junior Worlds was truly one for the history books for the US Team. For the first time in recent memory we had not one, not two, not three… but FOUR C2 boats racing in the events! Our C2 teams are something to be really proud of this year, with up and coming talent like Bryson Popp/Alex Sumida dominating their way into a best finish of 13th in the classic. Coming from the Team Trials as “Alternates”, Will Coggan/Gabriel Machado showed off the benefits of hard work and training over the past few months and secured a solid second amongst the US boats in every event. The coaches held a time trial, which preceded the official World Championship events, to determine the third boats for the C2 Team races, and so Zach Gallup/Nick Rinard took the Sprint Team race while David McConnell/Devon Dapuzzo went to the Classic Team race. For both the Classic and Sprint Team races, our C2 boats came in 6th place. Things got crowded easily on the narrow river of the Moravice, and so the C2 Team races especially were exciting to watch as the various countries mingled on the river. The K1 Men also had a full class this year. National Champion Cully Brown took a solid first in the Time Trial and finished a best of 40th in the Classic Race. Spencer Huff had a best finish of 49th in the Classic race and followed as the second kayak in the K1 Team races. As the third boat in the Team races Elliot Bertrand especially was another success story following months of training in a wildwater boat after racing the Junior Team Trials in a Wavehopper. He has come a long way to feeling comfortable in the boat and all who watched him race saw that when he finished a best of 50th in the Classic. Michael Autenrieth competed in the Individual races and had a best finish of 50th in the Sprint. 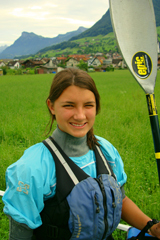 Naomi Everhart, still learning the ways of wildwater racing, impressed all with her determination to learn and the enthusiastic presence she had on the team spirit. Her best finish was 28th in the Sprint race and she joined her teammate Haley Popp and Aisling Smith of Ireland to compete as forerunners in the Team races. Haley Popp was the returning Junior Worlds veteran this year and had a best finish of 25th in the Sprint race. The team had a successful time in Europe as a whole, because everyone gained a lot of learning experience and useful preparatory knowledge for future training and possible future World Championship appearances, Junior and Senior alike. There was much enthusiasm for more races in the future, from competitors and parents alike. The team also made lots of new friends in their competition from the other countries, and enjoyed mingling with those who spoke other languages than English. Team Manager Tom Popp did a great job of leading the trip this year, organizing information, attending meetings, and getting everyone organized a the start lines. Coach Doug Ritchie helped out on and off the water assisting team members and encouraging all to do their bests. Doctor Mark Sumida also assisted the team as doctor, parent, and assistant. Much thanks to all of them for their help and support this year! Also, a big thanks is necessary to all the parents who came and supported the team, cheering everyone on in the races and helping out off the course too. THANK YOU!